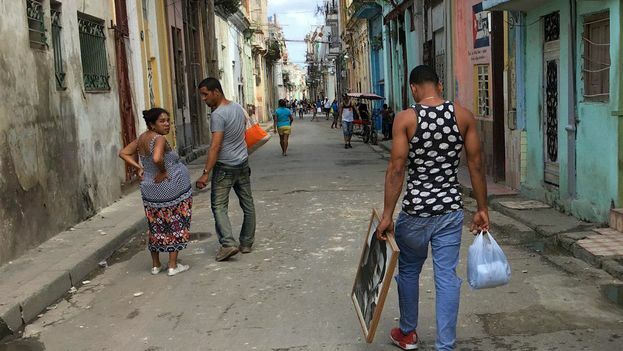 14ymedio, Marcelo Hernandez, Havana, 19 March 2018 — Between 2006 and 2014, only 125 men in Cuba accepted paid parental leave and the majority did so because of the mother’s illness or death, according to official data. Although the legislation provides for paternity leave, its use is still very unusual among men on the island. At the recent inauguration of the Swedish Dads…Cuban Dads photographic exhibition in the Castillo de la Real Fuerza Museum in the Historical Center of Old Havana, María Machicado Terán, representative in Cuba of the United Nations Children’s Fund (UNICEF), said that in 2017 only seven fathers accepted the benefit, in contrast to the 65 grandparents who have used it since the initiative was extended to these relatives, in 2017, as long as ther were working. Since 2003, Cuban men can opt for paternity leave to stay at home and take care of their children during the first year of life, while their wives work. The father can benefit from postnatal leave for childcare for 90 days after the birth. Maternity and paternity leave cannot overlap and only one of the two parents can take advantage of the benefit until the child reaches one year. Even so, both can have between two and five days off work right after the birth. More days are allowed if it is necessary to move. Men who apply for this benefit may remain off work until the child reaches the first year, and during the period in which they do not work they receive 60% of their total salary. The measure was approved amid a worrying demographic situation. About 20% of the population of the Island is over 60 years old and the fertility rate is only 1.72 children per woman, far from the figure of 2.1 needed to ensure population replacement. “The mother and father can decide which of them will take care of the son or daughter, the way in which this responsibility will be shared up to the first year of life and who will receive the social benefit (…) and they will communicate the decision in writing to the administration of each of their workplaces,” the law says. The Family Code of 1975 already established a “shared responsibility between the mother and the father to attend, care for, protect, educate, assist, give deep affection to and prepare for life their sons and daughters, as a right and duty of both.” But in practice the situation is very different. The persistence of sexist roles in the distribution of domestic tasks, along with a tense economic situation that makes many families prioritize male employment, are some of the causes behind the low rates of men applying for postnatal leave. A recent survey carried out in 2014 at the national level by the Ministry of Public Health, showed that only 18% of fathers of children between 36 and 59 months participate in the care and education of their children. During the opening of the photographic exhibition, the Swedish ambassador to Cuba, Jonas Lovén, explained that although his country took the lead in 1974 replacing postnatal maternal leave with parental leave, still today only a quarter of the men in that country take advantage of the measure.